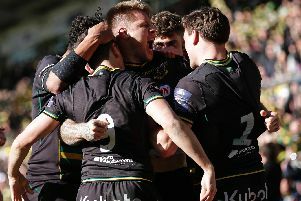 If Saints are to win the Anglo-Welsh Cup during the next couple of weeks, they will need to show the kind of consistency they have lacked of late. Following the winning streaks and losing streaks of the first part of the season, the black, green and gold have been much more mixed since the turn of the year. They have won five of their nine matches in 2018, often backing up a win with a defeat. But to claim glory in the one competition they have a chance of silverware in, they must now find a way to string together two big performances. The first of those has to come at Bath in the semi-finals tonight, with the winner of that tie taking on Exeter Chiefs or Newcastle Falcons at Kingsholm on March 18. Saints go into this week's game on the back of a hugely disappointing 34-25 home defeat to Sale, which came just seven days after a big performance at Exeter. And scrum-half Cobus Reinach said: "We had a very up and down season so it's hugely important for us to win two games in a row and win a trophy so at least we get a trophy this year and finish on a strong foot. "We have been building and we have been taking huge leaps in where we want to be, but then we got to a game where we took our foot off the accelerator. "We've needed to regroup and just get a plan for the weekend. "We want to go and dominate." Saints did manage to dominate during the opening 20 minutes on their previous visit to Bath, but after going 6-0 up, they crumbled, eventually losing 32-9 at The Rec last month. And Reinach said: "We went down there and we got a beating. "Everyone's excited, everyone wants to prove a point. "It is a semi-final and the ball can bounce any which way and anything can happen. "We're excited to change our performances around." There have been some tough reviews at the Gardens this week following that below-par performance at Sale. And Reinach knows he and his team-mates simply must front up at Bath. "After a game like that, a loss at home, there are definitely tough words said," he said. "We've been told to have a look at ourselves and it's a good thing. "We as players need to step up because there's only so much the coaches can do and it's on our shoulders now. "If you don't have a good game, you know as players where we have gone wrong, but it's also good to hear it and good to get back to the drawing board and make new plans." On the challenge posed by Bath, Reinach said: "They are a big team, they've got big runners, a good kicking game. "We have to bring our A game to beat them."